Boa constrictors are endangered and powerful snakes that wrap themselves around animals and squeeze them tight, preventing the creatures from breathing and eventually killing them. 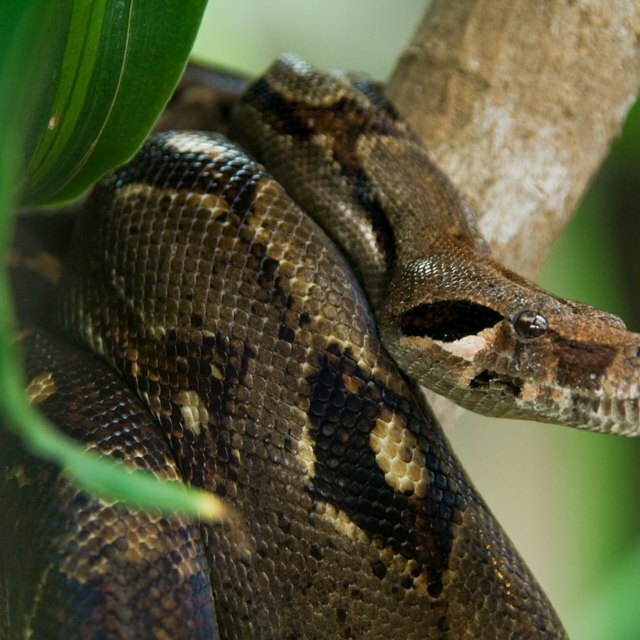 Boa constrictors can grow to lengths of 13 feet and can weigh more than 100 pounds. In the wild, boa constrictors can live 20 to 30 years. Boas are nonpoisonous constrictors that live from Mexico southward through Central America and into South America. They can be found mainly in hollow logs and abandoned animal burrows. These snakes have beautiful patterns and markings on their bodies that help them blend in with their surroundings. Shapes that are found on boas include ovals, circles and diamonds on their reddish, tan, green or yellow skin. These shapes and colors let them remain hidden while hunting and help them avoid their enemies. The jaws of a boa constrictor contain many sharp and hooked teeth. The snake grabs its prey with its mouth, and the teeth allow it to hold tight while the reptile wraps its muscular body around its prey, eventually suffocating it. Boas can capture, kill, and eat animals as large as monkeys and wild pigs. It would seem impossible for the snake to swallow animals this big, but it has the ability to stretch its jaws open very wide as it swallows the creature whole. 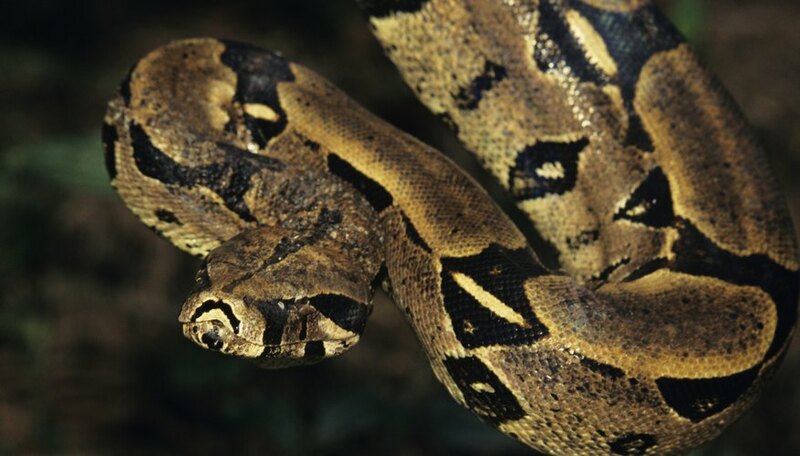 Boa constrictors can climb trees and are very good swimmers. Some will get up high in a tree or over a cave and grab bats as they fly by. Female boa constrictors incubate their eggs inside their bodies. When ready, boas can give birth to as many as 60 babies. Lindell, John. "Boa Constrictor Facts for Kids." Sciencing, https://sciencing.com/boa-constrictor-kids-5776740.html. 24 April 2017.